Prior to 2014 Ebola was mostly seen as a deadly disease but contained in remote areas of the world with a low likelihood of spreading. However, this false impression was dispelled when the disease hit heavily populated urban areas. Suddenly the world realized the Ebola outbreaks could reach epidemic proportions, and with an average fatality rate of approximately 50%, the potential impact could be catastrophic. In response, the scientific community rushed to develop a vaccine. The vaccine is a live attenuated recombinant virus, which means scientists have made or found a strain of the virus that our bodies can easily fight off. Live attenuated viruses essentially give your body’s immune system a practice round. Your body gets to know what the virus looks like by fighting off a weakened version of the dangerous virus. Thus, when you actually get infected with the real virus, your body has antibodies and cells already prepared to fight off the virus quickly. In the case of rVSV-ZEBOV, recombinant Vesicular Stomatitis Virus (rVSV) is the inside vaccine vector. This vector is a common basis for pseudoviruses and it has been heavily studied for use as a vaccine vector (Geisbert and Feldmann, 2011). 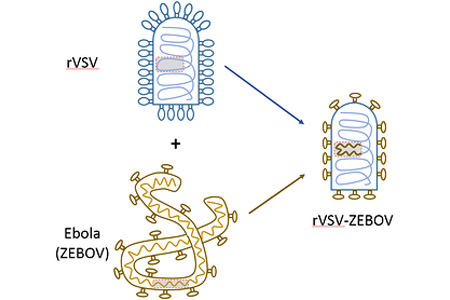 The outside of rVSV-ZEBOV is the Zaire strain of Ebola virus (ZEBOV). This is the part of the virus that an immune system can recognize, specifically to generate antibodies. This is a very powerful technique because it allows our body to make antibodies against the Ebola virus without ever coming in contact with the actual virus. The vaccine itself contains no live or dead Ebola virus, vastly improving its safety profile. Now the biggest problem is that many of the places where Ebola can strike are very difficult to reach. Since the vaccine is a live attenuated virus that means that to be effective, the vaccine needs to be stored at -80°C until it is administered. Maintaining the cold chain is a challenge when handling biologics such as vaccines, particularly when the clinic is in a remote location. Geisbert, T.W., and Feldmann, H. (2011). Recombinant vesicular stomatitis virus-based vaccines against Ebola and Marburg virus infections. The Journal of infectious diseases 204 Suppl 3, S1075-1081. Henao-Restrepo, A.M., Camacho, A., Longini, I.M., Watson, C.H., Edmunds, W.J., Egger, M., Carroll, M.W., Dean, N.E., Diatta, I., Doumbia, M., et al. (2017). Efficacy and effectiveness of an rVSV-vectored vaccine in preventing Ebola virus disease: final results from the Guinea ring vaccination, open-label, cluster-randomised trial (Ebola Ca Suffit!). Lancet 389, 505-518. Medaglini, D., and Siegrist, C.A. (2017). Immunomonitoring of human responses to the rVSV-ZEBOV Ebola vaccine. Current opinion in virology 23, 88-94.